Chancellor Susan Desmond-Helllmann, MD, MPH, presented awards to 11 members of the UC San Francisco community for their extraordinary contributions to the University and beyond. About 300 faculty, staff, students, friends and family members gathered for the UCSF Founders Day Luncheon, a festive, feel-good occasion held every year in the Millberry Union to recognize service. For their part, most awardees praised their colleagues who help them succeed, thanked their families for their support and reflected on the satisfaction they feel being part of UCSF, a nearly 150-year-old University exclusively focused on improving health. Established by Chancellor Philip Lee in 1970, this award honors members of the campus community who have performed outstanding service to the community at large, above and beyond that required by their University positions. The award grew out of the recognition that faculty, staff and students make important contributions to the welfare of the community through public service activities. James Dilley, MD, professor of clinical psychiatry, vice chair of the Department of Psychiatry, chief of the Department of Psychiatry at San Francisco General Hospital and Trauma Center and executive director of the Alliance Health Project. John Fan, PT, physical therapist II, Home Health Care, UCSF Medical Center. James Dilley: With 30 years of service at UCSF, Dilley is a self-described “accidental activist” who began working with AIDS patients while a resident at SFGH in the early days of the epidemic. Dilley established the first psychiatric clinic to help these patients and in 1984 launched the AIDS Health Project, now called the Alliance Health Project (AHP) to reflect its broader mission to support the mental health and wellness of the lesbian, gay, bisexual, transgender, queer and HIV-affected communities. “Throughout his career, Dr. Dilley has applied a social justice and compassionate care mission to key mental health challenges and needs of people impacted by HIV/AIDS, and more recently, he has extended his commitment to the broad array of LGBTQ communities,” writes his nominator Lowell Tony, MD, professor of clinical psychiatry and Endowed Chair in Psychiatry Medical Student Education. Dilley is credited for his exceptional leadership and management of AHP, which by 1996, developed the first HIV antibody counseling and testing protocol in the world and opened the first large volume counseling and testing program in San Francisco. In addition, AHP launched support groups for people with HIV, and authored what would become the longest running HIV and mental health publication in the world. Since that time, AHP has expanded several times over and has added many new services. Today, AHP serves more than 10,000 clients annually. Dilley's service to global health equity also was commended. He has provided HIV treatment training in Vietnam and was invited by the Bill & Melinda Gates Foundation to advise the Chinese government on HIV/AIDS prevention and treatment programs. In 2012, Dilley received the Levi Strauss Foundation's Pioneer Award, which honors innovative leaders who transformed lives because of their actions. Wheels for the World infographic by bsehenuk. John Fan: Fan’s public service efforts began in 2005 when his wife told him about Wheels for the World, an organization that provides free wheelchairs to disabled children and adults. 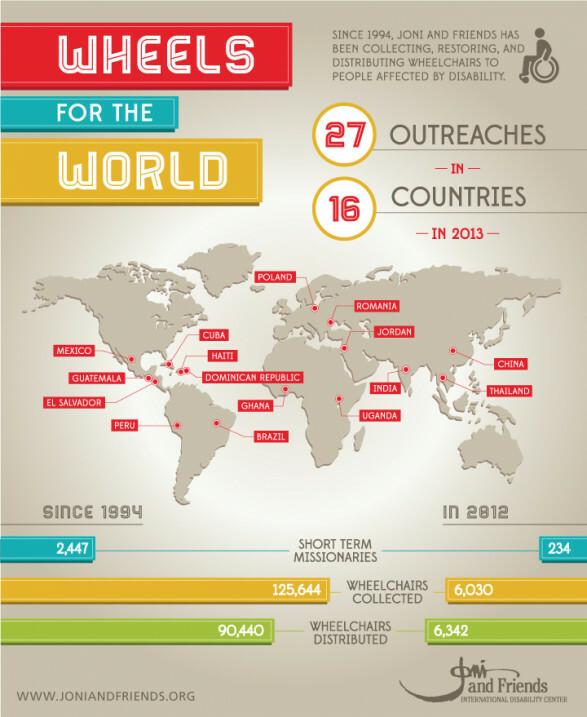 Established in 1996, the organization has been collecting, restoring and distributing wheelchairs to disabled people in 16 countries. Kate Hirschmann-Levy and Robert Pitts: Both fourth-year medical students, these two envisioned and established the Women’s Jailhouse Project, a multidisciplinary outreach program involving students from all UCSF graduate programs that gives incarcerated women information about reproductive and preventive health services. Hirschmann-Levy and Pitts became dedicated to serving this population since the majority of the approximately 250 inmates are low-income African-American and Latina women. Most are at a reproductive age and engage in high-risk behavoir. Hirschmann-Levy and Pitts have successfully recruited a large number of first- and second-year medical students, as well as nursing and midwifery students to carry on this volunteer project once they graduate. This award was created in 1978 by Chancellor Francis Sooy to annually recognize staff in non-supervisory roles who have consistently performed in their University positions at a level beyond what is ordinarily expected. Judith Laughlin: With 28 years of UCSF service, Laughlin is credited with providing superior care to children and families facing crises, ranging from childhood trauma to death. She constantly works to improve the quality of care, educating faculty, staff and students along the way. Laughlin’s work has raised the profile of and appreciation for the critical role that social workers play on the health care team. Laughlin’s work ethic and intellect are praised by colleagues. Katherine Murphy: With 20 years of service at UCSF, Murphy is lauded for her positive attitude while leading communications and events for the radiology department. Colleagues know her often working with a “smile on her face” and for her work on an award-winning magazine. This award recognizes outstanding service among those who have the responsibility to supervise, guide and lead others, as well as support the strategic goals of the University. Anja Paardekooper, assistant dean of Financial Affairs in the UCSF School of Medicine. Richard Capra: With 24 years of University service, Capra is recognized for his innovation, creativity and people skills. With his leadership, UCSF established the Orthopaedic Institute within two years. Described as the “best boss ever,” Capra is an advocate for mentoring and works to develop a cadre of leaders around him in the Department of Orthopaedic Surgery. Jon Giacomi: With 24 years of service at UCSF, Giacomi is known for his can-do attitude and his ingenuity. As director of the FAS Finance Service Center, he spearheaded initiatives to improve business efficiency and customer service. He is also credited for his exceptional leadership as deputy director of Campus Life Services. Anja Paardekooper: With a decade of service at UCSF, Paardekooper is credited for her engaging and thoughtful leadership and for constantly striving to improve performance in the School of Medicine’s financial affairs unit. She is an essential leader in campus projects, taking on the challenges in an environment where change doesn’t come easy. This award is presented to a professional nurse actively engaged in nursing practice, education and leadership at the Parnassus or Mount Zion sites of UCSF Medical Center. The award recognizes outstanding contributions to the care of patients and fosters professional and public awareness of achievements in nursing practice. The awardee is Denise Barchas, RN, MSN, clinical nurse 11 in the Medical and Surgical Intensive Care Unit, UCSF Medical Center. Barchas, who has eight years of UCSF service, is recognized for her exceptional leadership as a critical care nurse, especially in the areas of treating delirium and sepsis. She was one of the first critical care nurses invited to speak at a national conference. Established by Helen Pearl in 1993 to honor the late Milton J. Pearl, MD, a long-time Mount Zion surgeon and community member, this award recognizes a UCSF employee at Mount Zion who has consistently performed at a level beyond what is ordinarily expected. The recipient must have demonstrated exceptional willingness to render additional service of distinction to others. The awardee is Beth Crawford, director of Genetic Counseling and manager of the Cancer Risk Program in the Helen Diller Family Comprehensive Cancer Center. With 20 years of service at UCSF, Crawford is praised for her clear vision of how genetic counseling can revolutionize the practice of medicine. Crawford has been instrumental with the Athena Breast Health Network, the groundbreaking, University of California system-wide project to generate a rich collection of data and knowledge that will shape breast cancer care in the way the renowned Framingham heart study changed the care of patients with heart disease.